Home / Health Concerns / Digestion / Cooking in The Microwave Oven: Is It Safe? Cooking in The Microwave Oven: Is It Safe? I was amused (but not surprised) at the number of emails I received after describing my awesome high fiber, high Omega-3 English muffin recipe in a recent HealthBeat Newsletter. “I’m shocked,” one reader wrote, “that with all the studies on the dangers of microwave ovens, you still advise people to cook in them”! Now, I know that once some people have their mind made up about something, it’s hard to confuse them with facts. I’m sorry to disappoint, dear readers, but anyone who believes there are “numerous studies” proving the microwave oven is unsafe, damages nutrients in food or somehow does other bad things hasn’t really taken a close look at the scientific research on the issue. Many laymen — and even a number of “scientists” — are also seriously confused about the difference between ionizing and non-ionizing radiation, and even what the term “radiation” means. Let’s look at what is really known about the microwave oven, both pro and con, so you make an informed decision about its use instead of giving in to fear stories you may not really understand. Ionizing radiation, which includes nuclear radiation, medical X-rays, gamma rays and even tanning booth UV rays, is extremely high-energy. Ionizing radiation has enough energy to strip electrons off of atoms and at the highest levels of energy, to break apart the nucleus. Ionizing radiation is well known to damage DNA and cause cancer. 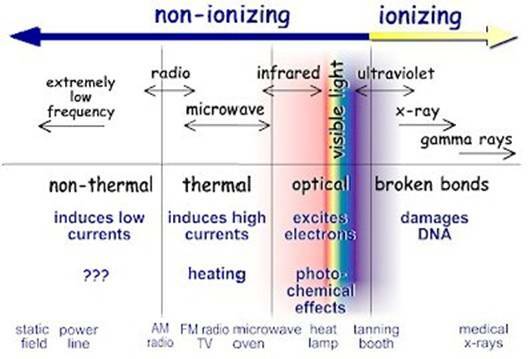 Non-ionizing radiation, which includes microwaves, sound waves and visible light rays, has enough energy to agitate atoms in a molecule and cause them to vibrate, but not enough energy to remove electrons. The motion caused by non-ionizing radiation creates heat (or vibration in the case of that “booming” car next to you at the stoplight – yep, that’s a particularly obnoxious form of “radiation”…). Graphic courtesy of the US EPA. In scientific terms, any emanation of energy, including sound and light, is referred to as “radiation.” All energy produces radiation. A light bulb produces radiation: it radiates both visible light and infrared (heat) rays. Human bodies produce radiation in the form of heat and sound. Don’t let the term “radiation” confuse you into believing that microwaves have anything to do with nuclear (high energy or ionizing) radiation. They don’t. The fact that many lay people equate “radiation” with nuclear (high energy) radiation is probably a large part of the basis of fear and misunderstanding about the alleged dangers of the microwave oven. There’s some “bad science” — and I mean really bad science — on the internet. Here is a quote taken directly from a web page concerning microwaves. Now that you’ve just had a real physics lesson, see if you can spot what is wrong with this picture. Do you see why this statement is scientifically incorrect? Remember, non-ionizing radiation (which includes microwaves) is energy that is too low to remove electrons from atoms or break atomic bonds. The author of the above quote clearly doesn’t know the difference between ionizing and non-ionizing radiation. When such “bad science” gets repeated over and over on the internet or elsewhere, people who also don’t know the difference between the two types of radiation are inclined to believe this simply because it has been repeated so many times! But the Earth isn’t flat just because everyone once believed it so, and microwave ovens utilize non-ionizing radiation, even though many websites categorize microwaves as ionizing radiation. People with an “agenda” who don’t do original investigative work but simply copy others and publish material which is patently false should, in my opinion, be dismissed without a second thought. This isn’t “research” or “science,” this is plagiarism and rumor-mongering. [Note: most government websites allow “fair use” — direct copying of their information — since it is tax-payer funded. But when someone steals text from a non-government website, it is plagiarism and copyright violation, both legal offenses. Worse, it is how big rumors and urban legends get spread like a virus through the population]. Let’s look at the prevailing “anti-microwave oven” claims and see if they are supported by scientific studies. Claim #1: Microwave cooking destroys nutrients in food. But hey, who ever checks out references in an article? Do YOU? Even when a reference is cited, do you ever actually verify that this is the actual conclusion of the study or article? No? We’ve got you covered. We DO verify and check references. It’s part of our investigative reporting and we take this work quite seriously. Claim #2: Microwaved foods contain more cancer-causing chemicals than conventionally cooked foods. Claim #3: Microwave cooking damages protein. Although rare studies show nutrient alterations with microwaving, most studies support the opposite. In addition to food value claims, anti-microwave camps cite other “evidence” against the use of microwave ovens. Since this information is floating around the internet and is frequently referred to, let’s take a look at the validity and importance of these claims. Claim #4: The Russians banned the microwave oven from 1976 to 1978 (or possibly 1987). Truth? Reportedly true according to someone who lived in Russia at the time, although not verifiable in my online research. (Except the hundreds of websites which mention this without substantiation). However, it is not clear WHY the microwave oven was banned. My “contact” from Russia wasn’t clear why the ban, but suggested that it might just as easily have been for social reasons (perhaps the government didn’t want people getting too “willful” to own such a decadent and expensive modern convenience) as it may have been for scientific reasons. There is also some discussion that the Russian government feared microwaves might be used for “mind control,” another possible reason for the ban since most of these appliances came from the US at that time. Today, however, I find no country in the world that bans the use of microwave ovens. This would suggest but not prove that no country feels there is sufficient scientific justification for outlawing their use. A number of anti-microwave websites claim that athermal effects are “not presently measurable.” Pardon me for asking the obvious but if these athermal effects are not measurable, how do we know they exist? There are also claims that microwaving “creates new compounds, called radiolytic compounds, which are not found in nature” and have all manner of destructive properties. As far as conventional science understands, only ionizing radiation can cause radiolytic compounds. There are no known radiolytic compounds formed by non-ionizing radiation. Claim #6: Microwaves can cause headaches, nausea, dizziness, or weakness. Truth? Although not studied per se, there are reports of some workers exposed to unshielded microwaves experiencing headaches, nausea and other symptoms. Note that these effects were from UNSHIELDED microwaves on the order of thousands of watts in power from radar stations or other high-powered transmitters, not from the minute amount of exposure encountered within 5 cm (about 2 inches) of an operating microwave oven. Claim #7: Microwaves can cause cataracts and burns. True. However, the amount of microwaves that you might be exposed to from a modern oven is minuscule compared to the amount of microwave energy known to cause this damage. At 5 cm – about 2 inches – a person is exposed to a minimal amount of microwave energy when a modern microwave oven is in use. This drops down to virtually nothing at 2 feet. Claim #8: Reports of a science fair project, where one plant was watered with regular water and one with microwaved water and the microwave-watered plant died, have made the rounds on the internet. There are even two un-sourced photographs, one of a healthy plant and one withered plant. Truth? This is not a study. It is internet urban legend. [Dr. Myatt’s aside: how many times have you received an email telling you something like “crooks are planting needles infected with AIDS on the inside of handles at the gas pump to infect people,” only later to have someone send you a page from Snopes.com or elsewhere telling you this was a hoax?]. The folks at Snopes.com tested this claim by taking three plants each of several types and watering one with tap water, one with water boiled over a stove and the third with microwaved water. Unlike the pictures accompanying the “science fair” chain email, Snopes controlled for other variables. In Snopes’ version of the “experiment,” all plants fared the same. Claim #9: Perhaps the single biggest piece of damning “information” regarding the effects of microwaved food is an alleged study performed in the 1990’s by a Swiss researcher. Unfortunately, reports of this “study” have been plagiarized and repeated so many times on the internet that many people have come to regard it as fact. Even more unfortunate is that the original report, if indeed it ever existed, has mysteriously vanished. This means that credible researchers cannot read the original study to evaluate its quality or importance. The results of this study are not available because [CAUTION: CONSPIRACY THEORY AHEAD] the giant corporate makers of microwave ovens in Switzerland had a gag order issued against the “scientist” and his paper couldn’t be published or was retracted and is no longer available for public viewing. The story tells of a Swiss scientist, Hans Hertel (an avid vegetarian), who conducted a study where a group of 8 people (of whom he was one) were fed conventionally cooked food or microwaved food. After two months, the results of his study reportedly found that those fed the microwaved food had decreased hemoglobin, leukocytes, and cholesterol. Legend has it that the study was published but then subjected to a court-imposed “gag order” and is therefore no longer available for review. It certainly cannot be found now despite later reports that the “gag order” has been rescinded by the Swiss courts. My question: If this paper is not available for public review, how can so many websites cite a study they have never reviewed? Possible answers: “take it on faith” or “plagiarism,” – but neither constitutes good scientific journalism or research. Even without benefit of the actual study, second-hand reports of the study’s conclusions never-the-less raise numerous red flags. Hertel suggests that his study demonstrated alterations in blood test results that were early evidence that microwaved food was causing cancer in the subjects blood. “Evidence of cancer in the blood” after two months? What test was used to detect “cancer in the blood” after two months of eating microwaved food? Today, we WISH we had some sort of simple, reliable blood test that would allow early detection of cancer in the blood. Unfortunately, no such blood test exists. A review of the “report of the study” (not the actual study itself, which is unavailable), reveals numerous contradictions, incorrect references to ionizing radiation and “results” that are unprovable by any known modern-day standards or tests. This study isn’t a study at all; it’s a pseudo-science “vapor-report.” Unfortunately, this one “study,” if it happened at all, appears to be the sole basis and magnum opus of most of the anti-microwave movement. If you are going to be afraid of something, worry about the unshielded microwaves that we are all constantly exposed to from microwave cell phone towers. Or how about the unshielded microwaves you are exposed to from your cell phone, your Blackberry and your Bluetooth, or even the automated alarm system in your car? Remember, your microwave oven has heavy-duty shielding and a cut-off device which automatically stops the generation of microwave energy the instant the door is opened. All the other microwave-utilizing devices in your life do not have such safety cut-offs and shielding. The real and proven dangers of microwave ovens are related to “thermal effects” — that’s heat, folks. You can burn yourself on your stove top and you can burn yourself on hot food prepared in the microwave. Many websites quote the “baby’s bottle” danger (the bottle heated in the microwave burned the baby), but this is a thermal effect combined with “operator error.” Mom or babysitter forgot to gently agitate the bottle to distribute the heat evenly, and then test temperature before giving to baby. This can happen with a bottle heated on a stove, too. Food cooked in a microwave oven doesn’t heat evenly, and tends to heat more in some spots than in others. For this reason, cooking meat can be “iffy,” because some parts may not get hot enough to destroy bacteria. Lack of full through-and-through cooking is also a concern even in a conventional oven, hence the recommendation for using a meat thermometer to guarantee adequate internal temperatures of meat. The Bottom Line: regardless of what you have heard (including those “internet legends”), there is no sustentative evidence that sensible microwave cooking does anything evil to the food. What you will find on the internet is, literally, hundreds of websites all parroting the same one unsubstantiated study — the one that has disappeared and no one writing about it has actually seen. I found an additional number of websites saying things like “destroys 97% of the food value,” again, with no study or citation to back up this claim. Microwave energy can be harmful to people, but the amount that escapes a microwave oven is extremely small, drops off to virtually nothing at a distance of 2 feet, and pales in comparison to the amount of exposure we are all subject to from so many of our other modern conveniences. Even without environmental exposure to man-made microwaves, humans have always been exposed to some degree of microwave radiation from space(AI). Scientists have studied how well living systems (animals, humans) tolerate this background microwave radiation. It turns out that the water molecules in our bodies do a great job of buffering microwave radiation. The conclusion of most scientists is that life has, perforce, adapted well to background microwave radiation. The bottom line is that unless you get IN the microwave oven when it’s turned on (don’t try this at home, kids! ), the small amount of exposure is well tolerated by living systems. Dangerous levels of exposure might be had from unshielded microwave sources like cell towers or even cell phones, but no such dangers are known from microwave oven exposures or cooking. 1.) Heat can burn. Repeat after me, “thermal effects.” Just like you can burn your hand on a hot stove top or oven. And when you do REAL research to discover the dangers of the microwave, “thermal effects” are the dangers that come up. That “super heating” of water, the baby’s bottle that wasn’t agitated to distribute the heat evenly in the milk, even dangers of cataracts caused by microwaves — are all thermal effects. And by the way, the thermal effects from the small amount of microwaves that can escape the oven’s seal are NOT enough to cause any known thermal effects including cataracts. Cataracts have been seen in massive accidental industrial exposure to microwaves, not microwave ovens. 2.) EMF’s. (ElecroMagnetic Fields) The electromagnetic frequencies at the lower end of the non-ionizing spectrum are of far greater concern to human health. Unlike the “dangers of microwave ovens” where you will NOT find more than a couple of small reports of possible concern, the dangers of EMFs have a lot more documentation. I tested my microwave oven while in use. Up close, the EMFs were high during cooking. Back off to a distance of three feet, and the level of EMF drops to normal background levels. Again, don’t stand close and stare in the microwave while it’s working, but a distance of only three feet puts microwaves (the small amount that may escape through the door seals) and EMFs at normal background levels. If you think this sounds like a spooky reason to abandon your microwave, please know this – the digital clock on my conventional stove puts out as much EMF as the microwave does when cooking, but it does this 24 hours per day! (If you test, you’ll find a number of EMF sources in your house that are far higher than the micro during cooking, and many of these sources of EMF are radiating continuously). 3.) Certain plastics can melt, release toxic chemicals, or otherwise behave badly when microwaved. Be sure that any plastics you place in your microwave are listed as being “microwave safe.” Better yet, avoid putting plastic in the microwave – use glass or ceramic cookware. 1.) Preserves nutrients. Food can be cooked at a lower temperature. This is why I use the microwave oven to bake my special English and blueberry muffins. At only 90 seconds, I measured the internal temperature in the finished muffin and found that it was low enough for the fragile Omega-3 fatty acids to remain undamaged. Bake these same nutrient-dense goodies for 20-30 minutes in a conventional oven at a temp of 350 and the likelihood of ruining the Omega-3 fatty acids increases substantially. Kiss your Omegas good-bye! Microwave cooking has been shown to create fewer dAGEs (dietary Advanced Glycation End products). What are dAGEs you ask? Dietary Advanced Glycation End products are known to contribute to increased oxidant stress and inflammation, which are of course linked to both diabetes and cardiovascular disease and a host of other “age-related” health problems such as cataracts. dAGEs are created when foods are heated during cooking and can be significantly reduced by cooking with moist heat, using shorter cooking times, cooking at lower temperatures and cooking with a microwave oven. 2.) “Fast Food Convenience.” In my practice I have busy families (heck, I AM a busy family!) that will eat freshly cooked broccoli if it can be steamed and ready in 7 minutes in the micro. But 30 minutes on the stove-top (waiting for water to boil plus steaming time) with comparable nutrient values? It’s not happening! “Fast food,” especially the healthy kind, is a boon to many people. I dare anyone to find ten credible references — wait, make that five — about the dangers of microwave ovens. You’ll find the baby bottle report, one case of blood for transfusion being microwaved and being lethal when used (thermal effect causing denaturing of blood proteins is the likely reason), immune globulins is breast milk being decreased by microwave heating (thermal effects cause this, and any heating method above 60 degrees centigrade will damage immune globulins in milk(J)), and, and, and… that’s about it. (Putting a poodle in the microwave to dry it after a bath does not count as a real hazard of the microwave. I don’t recommend the “poodle in the conventional oven” technique, either). Preservation of nutrients is good, exposure to microwaves themselves is miniscule compared to other microwave sources in our environment and most dangers of microwaves are from unshielded sources, not microwave ovens. All other dangers are thermal — heat related — and I can burn my hand on the stove or oven just as surely as I can on food heated in the microwave. If you take me up on this challenge, please don’t waste my time (or yours!) sending hearsay from a website with no substantiation. I’ve already explained how there are literally hundreds of sites spouting the same solitary “no one’s ever seen it” study. I moved to Arizona because the deep well-water is pure and thus I could avoid fluoridated and chlorinated tap water. My water is some of the finest in the country, and I still test my well every year. I also live where I do because the air quality is pristine compared to most areas of the country. I raise my own organic eggs, buy organic meat and non farm-raised fish, buy organic vegetables and grow my own when the weather is good. I don’t use cosmetics with artificial ingredients; I clean with non-toxic detergents and soaps and avoid any chemical (such as weed killer) that has any known toxic effect. The hot tub is treated with hydrogen peroxide, not chlorine. I don’t use an electric blanket and avoid having EMFs within 8 feet of my sleeping space. I am known as “The Dragon Lady” in the nutritional foods industry because of my uncompromising standards for both raw materials and finished product specifications. I take my own supplements in order to insure that I’m getting the purest products available. My straw-bale home is painted with low volatile organic (VOC) paints. There are no synthetic carpets, carpet pads, wallboard materials or furniture in my home that are known to off-gas potentially dangerous chemicals. When I fill water bottles with my pure well-water for daily drinking, I use glass bottles. I don’t use food or condiments with preservatives that are known or even suspected to cause harm to the body’s respiratory chain (mitochondria). I have had all of the mercury fillings in my mouth replaced with composite materials that I tested non-allergic to. Why am I telling you all this? 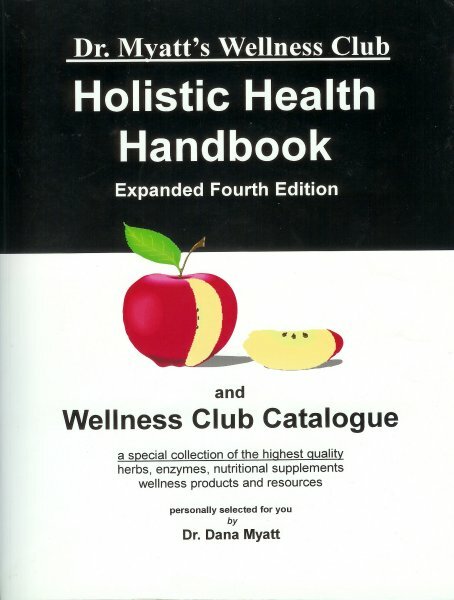 To help you see that I go to great lengths to avoid anything known to be toxic or harmful to my body. Even without solid proof, I am wary of some things when there is good theoretical reason to believe it could be harmful. Let me put it another way. Do you really believe that I would personally use a microwave oven if I had any reason to believe — after doing exhaustive research — that there was a credible risk? Given the rest of my profile, I think you’d have to conclude that this would be highly unlikely. I use a microwave because it saves time and energy while preserving food value and because no one has presented me with even a modicum of substantiated evidence that the microwave oven is anything but a modern blessing. When someone presents me with credible evidence, I am certainly willing to change my mind. Until then, I won’t be a sheep and believe something just because “everybody says it.” I’m not a member of the Flat Earth Society, either. B.) Ioku K, Aoyama Y, Tokuno A, Terao J, Nakatani N, Takei Y. Various cooking methods and the flavonoid content in onion. J Nutr Sci Vitaminol (Tokyo). 2001 Feb;47(1):78-83. C.) Hernández-Infante M, Sousa V, Montalvo I, Tena E. Impact of microwave heating on hemagglutinins, trypsin inhibitors and protein quality of selected legume seeds. Plant Foods Hum Nutr. 1998;52(3):199-208. D.) Watanabe F, Abe K, Fujita T, Goto M, Hiemori M, Nakano Y. Effects of Microwave Heating on the Loss of Vitamin B(12) in Foods. J. Agric. Food Chem. 1998 Jan; 46 (1): 206–210. E.) Hoffman CJ, Zabik ME. Effects of microwave cooking/reheating on nutrients and food systems: a review of recent studies. J Am Diet Assoc. 1985 Aug;85(8):922-6. F.) Osterdahl BG, Alriksson E. Volatile nitrosamines in microwave-cooked bacon. Food Addit Contam. 1990 Jan-Feb;7(1):51-4. G.) Klein BP. Retention of nutrients in microwave-cooked foods. Bol Asoc Med P R. 1989 Jul;81(7):277-9. H.) Cross GA, Fung DY. The effect of microwaves on nutrient value of foods. Crit Rev Food Sci Nutr. 1982;16(4):355-81. I.) López-Berenguer C, Carvajal M, Moreno DA, García-Viguera C. Effects of microwave cooking conditions on bioactive compounds present in broccoli inflorescences. J Agric Food Chem. 2008 Mar 26;56(6):2296. J.) Nutritional effects of microwave cooking. Lassen A., Ovesen L. Nutritional effects of microwave cooking. J. Nut & Food Sci: 1995 Vol 95 Issue 4 Page 8 – 10. K.) Quan R, Yang C, Rubinstein S, Lewiston NJ, Sunshine P, Stevenson DK, Kerner JA Jr. Effects of microwave radiation on anti-infective factors in human milk. Pediatrics. 1992 Apr;89(4 Pt 1):667-9. L.) F Vallejo, FA Tomás-Barberán, C García-Viguera. Phenolic compound contents in edible parts of broccoli inflorescences after domestic cooking. Journal of the Science of Food and Agriculture, 2003 Volume 83, Issue 14 , Pages 1511 – 1516. M.) Yuanyuan Huanga, Jianchun Shenga, Fangmei Yanga and QiuHui Hu. Effect of enzyme inactivation by microwave and oven heating on preservation quality of green tea. Journal of Food Engineering Volume 78, Issue 2, January 2007, Pages 687-692. Volume 93, Issue 4, December 2005, Pages 713-718. P.) Barrington, PJ et al. Mutagenicity of basic fractions derived from lamb and beef cooked by common household methods. Food and Chemical Toxicology 1990; 28(3): 141-6. Q.) Jonker, D and Til, HP. Human diets cooked by microwave or conventionally: comparative sub-chronic (13-wk) toxicity study in rats. Food and Chemical Toxicology 1995; 33(4): 245-256. R.) National Cancer Institute. Cancer facts – heterocyclic amines in cooked meats. National Cancer Institute; 1996. S.) Chiu CP, Yang DY and Chen BH. Formation of heterocyclic amines in cooked chicken legs. Journal of Food Protection 1998; 61(6): 712-9. T.) Phillips DH. PAHs in the diet. Mutation Research 1999; 443:139-47. U.) Chiu CP, Yang DY and Chen BH. Formation of heterocyclic amines in cooked chicken legs. Journal of Food Protection 1998; 61(6): 712-9. V.) Skog K and Solyakov A. Heterocyclic amines in poultry products: a literature review. Food and Chemical Toxicology 2002; 40: 1213-1221. W.) Felton JS, Fultz E, Dolbeare FA and Knize MG. Effect of microwave pretreatment on heterocyclic aromatic amine mutagens/carcinogens in fried beef patties. Food Chemical Toxicology 1994; 32(10); 897-903. X.) Lee SJ, Shin JH, Sung NJ, Kim JG, Hotchkiss JH. Effect of cooking on the formation of N-nitrosodimethylamine in Korean dried seafood products. Food Additives and Contaminants 2003; 20(1): 31-6. Z.) Ovesen L, Jakobsen J, Leth T, Reinholdt J. The effect of microwave heating on vitamins B1 and E, and linoleic and linolenic acids, and immunoglobulins in human milk. Int J Food Sci Nutr. 1996 Sep;47(5):427-36. AA.) Sierra I, Vidal-Valverde C. Vitamin B1 and B6 retention in milk after continuous-flow microwave and conventional heating at high temperatures. AC.) Anita Kataria, B. M. Chauhan. Antinutrients and protein digestibility (in vitro) of mungbean as affected by domestic processing and cooking. Food Chemistry Volume 32, Issue 1, 1989, Pages 9-17. AD.) F.P.P. Machadoa, J.H. Queiróza. Effects of heating on protein quality of soybean flour devoid of Kunitz inhibitor and lectin.Food Chemistry Volume 107, Issue 2, 15 March 2008, Pages 649-655. AE.) Cain, et al. Heat Changes Protein Structure: Frying an Egg. Discover Biology, Third Edition, W. W. Norton & Co.2006. AF.) Peter de Jong and H. J. L. J. van der Linden. Polymerization Model for Prediction of Heat-Induced Protein Denaturation and Viscosity Changes in Milk.J. Agric. Food Chem., 1998, 46 (6), pp 2136–2142.